Employee mistreatment and corporate scandals have become the norm for ride-hailing companies. Uber faces numerous well-documented harassment allegations, claims of data stealing and a massive executive exodus, but other ride-hailing companies have issues up top as well. Lyft opposes driver unionization efforts, the supposedly “driver friendly” app Juno got sued by drivers for making empty promises and the women-only service Safr’s CEO was arrested for fraud. RideAustin is a nonprofit, community-based rideshare service that gives drivers more money since it doesn’t take any commission. Two hometown heroes created the service after Uber and Lyft threw a temper tantrum in May 2016, resulting in their abrupt departure and leaving its Austin drivers jobless within days. RideAustin swooped in, completed 2 million trips, paid drivers $5 million than if Uber and Lyft stayed and raised $250,000 to Austin-based charities for arts, AIDS prevention, Autism awareness and animal shelters. Though RideAustin and other community-based ride-hailing apps that emerged after Uber and Lyft’s dramatic departure surged in popularity, they’ve been struggling since the two giants came back earlier this summer. RideAustin ride volume is down 62 percent from the week Uber and Lyft returned, and company CEO and co-founder Andy Tryba told Jalopnik things could get worse. “I do believe that local is a model that could succeed, but we’ll see whether or not RideAustin got it right or not,” RideAustin CEO and co-founder Andy Tryba said in an interview with Jalopnik. Drivers and riders alike preferred the corporate practices of community-minded services like RideAustin, but Uber and Lyft, problematic as they may be, seem to have already monopolized the ride-share market. And that’s bad news for everyone. Last summer, Uber and Lyft drove the city of Austin insane with an $8 million campaign convincing residents to vote against a city fingerprint requirement for drivers. The company argued the extra effort to get a full background check would deter drivers. The company clobbered Austinites with unending phone calls and flyers trying to get them to the polls. Ultimately, residents decided they valued vetting drivers with fingerprints over complying to Uber and Lyft’s incessant whining. As a retaliation, the two ride-hail giants left the city days after. Drivers were instantly out of jobs, and riders out of options. After Uber and Lyft left, Hansen started driving for Fasten and RideAustin, two of the eight ride-share companies that sprung up in the big guy’s wake. Other services like Fare and Get Me arose, but those had hard-to-use apps, long wait-times and other inconveniences for both riders and drivers, Hansen said. Fasten doesn’t have a non-profit model like RideAustin and operates in Boston as well, but the two share a community-first mindset. Furthermore, Hansen said Fasten and RideAustin are committed to giving drivers a larger chunk of earnings. Fasten takes a fixed $0.99 commission for every trip, instead of taking 20 to 30 percent of earnings like Uber and Lyft do. Austin resident and ride share user Stella Martin said she, too, chose Fasten and RideAustin after Uber and Lyft’s departure, noting better customer service from the apps and even paying less for rides occasionally. Martin also mentioned how Uber’s sexual harassment allegations and the resignation of CEO Travis Kalanick turned her off from the company completely: “There’s so many corporations that just have no morale whatsoever and I don’t wanna support that,” she said. Though Uber and Lyft settled a deal with the city and came back to Austin last May, Martin and Hansen continue to use Fasten and RideAustin for both their contributions to the community and to local drivers, as well as lingering anger at the ride-hail behemoths for leaving in the first place. RideAustin’s nonprofit model didn’t just bring Austin together; the service may have found a solution to Uber and Lyft’s driver pay equity problem and the massive disruption ride-share had to public transportation. 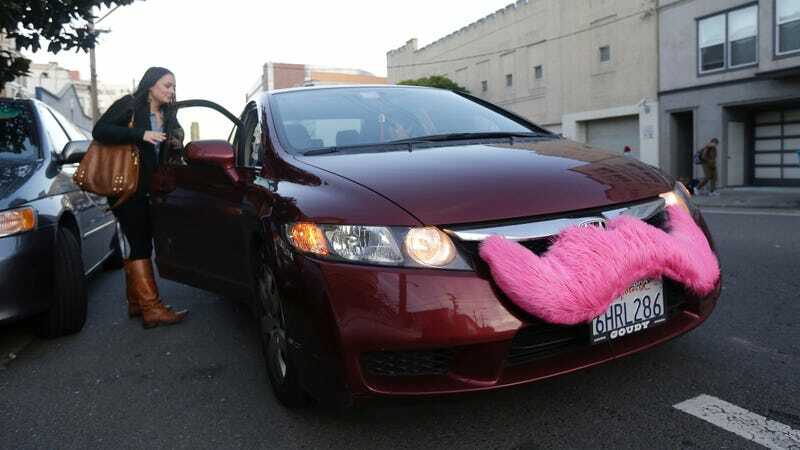 Uber and Lyft transformed mobility, but not without hurting other transportation services. Taxi cabs bear the brunt of riders switching services, and now public transportation may be in peril. Using private rideshare services over taking the bus or train takes needed money away from public infrastructure maintenance and expansion. Ride-share services may be more convenient, but they usually are not more equitable. For example, Uber and Lyft are inaccessible to anyone without a smartphone. As of 2016, this means 23 percent of Americans—about 75 million people—can’t get ride-share services, according to Pew Research Center. Lyft recently launched a shuttle service with fixed routes and pickup locations in San Francisco (in other words, they made a bus), but Salon found the routes don’t approach working-class neighborhoods like Richmond, Bayview or Outer Sunset and strategically skirts the low-class neighborhoods of the Tenderloin and Civic Center. Part of the issue is a lack of transparency. Since private rideshare companies aren’t obliged to share data, it’s nearly impossible to hold them accountable. Furthermore, policy makers need data from ride-hailing companies to make successful decisions regarding transportation, according a data-sharing recommendation by the National Association of City Transportation Officials. Most rideshare companies still fall flat on the recommendations suggested—except RideAustin. One of RideAustin’s key, commonly overlooked principles is the company’s insistence on transparency. Tryba said ride-share companies today do not collaborate with each other or disclose their data, which hinders transportation innovation. “Much like an open source community, it’s through collaboration that we get through that higher level of mobility services,” he said. The local and nonprofit models of RideAustin and, to a lesser extent, Fasten seemed to serve drivers, policy makers and the Austin community much better than did Lyft and Uber. But that may not matter at all, as the two monoliths of ride-sharing are back with a vengeance. Much like RideAustin, Fasten founder and CEO Kirill Evdakov told Jalopnik growth slowed since Uber and Lyft’s return, and the two have been lobbying drivers and riders to come back on the service with ample promotions. Fare, another service, shut down operations in Austin weeks after the ride-hail giants’ return. “They just seem to be cooler things to a lot of the students around here, and I think that pushes people back to Uber and Lyft,” Kuhr added. Still, many in Austin hope local ride-sharing stays alive in the future. Kuhr said healthy market competition needs numerous ride-hailing options, coupled with efficient public transportation. An Uber and Lyft duopoly cannot ensure riders get equitable or better service. Martin and Hansen, too, remain optimistic about their community-minded ride-share alternatives, but admitted Uber and Lyft are likely to regain popularity.